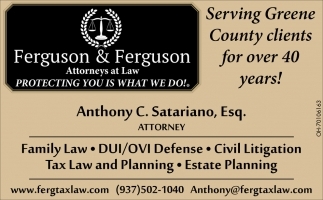 Family Law, DUI/OVI Defense, Civil Litigation, Tax Law and Planning, Ferguson & Ferguson: Anthony C. Satariano, Esq. Ferguson & Ferguson: Anthony C. Satariano, Esq. Serving Greene County clients for over 40 years!